The tiny village of Bakhta in Siberia, one of the most beautiful yet severe places on the planet, is home to some 300 indigenous inhabitants whose lives are virtually untouched by modernity. Located at the heart of the Siberian Taiga on the banks of the Yenisei River, Baktha has no telephones, no running water and no medical aid—it’s actually so far away from civilization that it can only be reached by helicopter or boat. In Bakhta the local population of hunters, fishermen and trappers embark on daily routines using tools, materials and methods that have barely changed over the past centuries. Happy People: A Year in the Taiga follows the lives of the people of Bakhta through all four seasons of the year—from the winter, when the river freezes over and snows cover the sub-zero land, through the eventual thaw and flourishing of flora and fauna in the spring and summer, up to the approaching chill of autumn and the beginning of the cycle anew. The origins of the film are nearly as fascinating as the Russian and Ket people of the Russian North that the film celebrates. 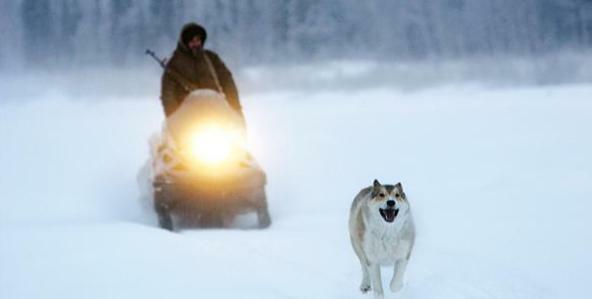 In Los Angeles, a friend of Herzog’s had obtained a four hour documentary by director Vasyukov about hunters in the Siberian Taiga that had originally aired on Russian television. He screened them for Herzog, who was immediately intrigued by the material. Herzog soon contacted Vasyukov (initially via Skype) and proposed that they collaborate on adapting the film for Western audiences. The result is Happy People: A Year in the Taiga, featuring new commentary written and narrated by Herzog himself.